Cities: Skylines is not a God game. You can shape and build your city exactly how you see fit, but that moniker is maybe a misnomer. I may only be the mayor, but that wouldn’t stop me from raising taxes exorbitantly for a month or two whenever the mood strikes. I was also tasked with keeping up with the demands of my citizens. You exist somewhere in the middle. I can’t just snap my fingers and solve my mounting energy issues, but I can bulldoze a road and prevent any access to parts of the city on a whim. If God really is just a kid on an anthill with a magnifying glass, then it makes sense, but Cities: Skylines never relents. I had endless fun trying to piece together a functional city by the seat of my pants and constantly having to put out some fire (both literal and figurative) in my ever expanding town. My only complaint having played the Switch version of the game is that, while entirely playable and often incredible and cathartic to tend my digital garden while on a plane for instance, it simply lacks the precision of a mouse and keyboard when small scale revisions are necessary. 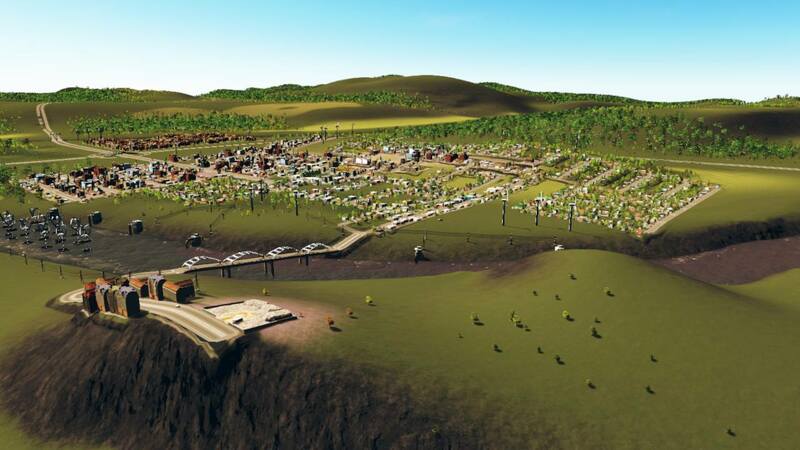 Cities: Skylines does an admirable job easing you into many of its broader concepts. You’ll start by placing a road from the freeway and quickly learning how to zone spaces for different types of buildings (residential, commercial, and industrial) and how to provide water and power to your buildings. These are the basic building blocks that the game adds on top of. As your population grows, so do the people’s needs. You’ll unlock schools, hospitals, police departments, and even large landmarks as you progress. The balancing act this game presents then comes from constantly managing the growing assortment of necessary services. My town of Rennes (randomly generated and not nearly as successful as the proper French town) grew large enough that the citizens started to require schooling, so I put in a school. But then the garbage started piling up. I put in a dump. People started getting sick. I go to put in a hospital, but I don’t have enough money, so I raise taxes. The people then get upset about their taxes. It goes on like this forever. For every fire I put out, three more would spring up somewhere else. The game does a remarkable job tracking and presenting all the different data points on your town. You can get thoroughly granular details about how much you’re spending on each city service, specific breakdown on the number of citizens you have of varying ages, the city’s ground pollution percentage, and color maps of high traffic areas. You’re never lack for information, but the deluge of data can purposefully be overwhelming. Where the game succeeds is in making all that data accessible while only ever serving as the soil you use to tend to your garden. If you can get all the data in the green, your garden will flourish and the people will be happy; otherwise, you’re going to experience trash pile ups and rolling blackouts as you scramble to build a new cemetery to deal with the constantly dying populace. If a management game of this type sounds appealing to you, Cities: Skylines is not only the best option on the market, but is effectively the gold standard for games of this sort for the time being. Like I mentioned earlier, I had a great time playing the game in handheld mode on the Switch for this release. It was the perfect travel companion game. I loved playing it in bed or at the airport terminal. The experience is slightly diminished in terms of resolution and occasionally the framerate when undocked, but never enough to make the game unreasonably burdensome to play. If you’re planning on playing the game exclusively in docked mode, it will definitely look crisper, but it’s hard to recommend over the pinpoint accuracy of the PC version. The console version offers a valid and serviceable facsimile of that experience, but when the city’s size grows and you need to start relocating buildings to build upgraded roadways, or if you would like to dive straight into the deep end and start personally naming your buildings and citizens, while all these options are technically possible on the Switch, it doesn’t provide the smoothest, most natural experience. Where this version shines is seamlessly putting that diminished version in the palm of your hands. It’s a great example of where the Switch version truly has a leg up on other console versions based solely on its inherent hardware specifications. It’s exciting to merely build a functional town, but it becomes something truly special when you can not only build a competent town, but you build something unique to you. Do you want to build a town on completely green energy? You can start placing wind turbines and enforce a recycling policy, or promote bicycle use in your towns and build roads to accommodate a large amount of bicyclists. But if you would rather double down on coal energy and have no recycling system in place, you can absolutely do that. You want your town to have recreational marijuana and free public transportation? The policies all have pros and cons, but you are free to shape your city precisely how you’d like. It’s a deep and rewarding system that seemingly has no bottom to the complexities, but when you can finally see the depths and start to fashion a respectable city in your image the kid on the anthill grows up and starts intentionally crafting something potent and beautiful. The depth on offer in Cities Skylines is staggering, which is why being able to pick that up and take it with you is so exceptional. There is a limit to how successfully the console version is able to emulate the PC experience, but it does a good enough job that I can’t recommend the game enough to the Switch owner hankering for a city building game for their favorite hybrid console.